Brian T. Smith, a member of Dykema's Litigation Practice Group, focuses on general civil litigation, with an emphasis on product liability defense. He has handled numerous product liability cases involving catastrophic injury and death, consumer product class action claims, and a variety of commercial and contract disputes. He has defended numerous automotive and other product manufacturers in litigation across the country, including in Michigan, Illinois, Ohio, Tennessee, Indiana, California, Alabama, Florida, Texas, Nevada, Missouri, Pennsylvania, New Jersey, New York, Arizona, and the U.S. Virgin Islands. Several of these manufacturers have asked Mr. Smith to present at in-house seminars on a variety of topics including rollover accidents, forklift litigation, and Michigan procedural requirements. Mr. Smith is also counsel for automobile negligence cases. He has handled several automobile negligence cases, including company car and fleet related claims, on behalf of a number of companies. Mr. Smith has also first chaired automobile negligence trials. In addition to his automotive work, Mr. Smith has handled a number of premises liability and workplace safety cases in Michigan, Illinois and Indiana. Mr. Smith also represents a number of clients in asbestos related matters and has presented on asbestos litigation and expert issues in asbestos cases. He currently serves as Michigan and Illinois counsel for a number of manufacturers of valves, pumps and automotive related parts. Mr. Smith has assisted in the trial numerous cases to verdict throughout the U.S. 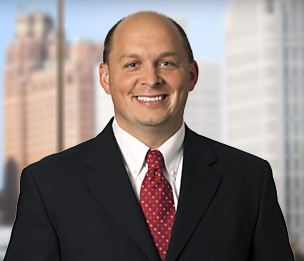 He serves as national and regional trial counsel for automotive manufacturers and suppliers on a variety of commercial and intellectual property disputes. Mr. Smith also serves as regional counsel for asbestos cases in Michigan and Illinois. Regional counsel for premise and workplace safety claims. In-state counsel for automobile negligence claims for a variety of companies. In-state counsel for lemon law related claims. Desiree Henry v. Mark Redmond and General Motors, Case No. 15-104390-NI, Genesee County, MI. Defense verdict following a one-week trial. Plaintiff claimed to have suffered serious impairments, including a closed head injury, as a result of an automobile accident involving a company car. Plaintiff alleged that the company driver ran a red light. Sally Small, as guardian of Keanna Small v. Ford Motors Company and Key Safety Systems, Inc., 9:12-cv-80841-KAM, USDC, MD, FL. Defense verdict following a three week trial and after less than two hours of deliberation. Plaintiff sued Defendants, alleging that Keanna Small was ejected from the front passenger seat of a 2002 Explorer during a rollover accident because of a defect in a seat belt. Ms. Small was ejected from the Explorer and sustained a traumatic brain injury. Plaintiffs asked the jury to return a verdict in excess of $100 million, as compensation for $2.2 million in past medical expenses, $26 million for future medical and life care, and pain and suffering. Harman v Key Safety Systems, Inc., Mobile, Alabama, Case No. CV-08-901193. Defense verdict following a three week trial on plaintiffs’ claim that a defective seat belt system caused her to be ejected from her 2003 minivan during a rollover accident. Plaintiff Patricia Harman, who was 6 weeks pregnant, sustained injuries that rendered her quadriplegic and caused her son to be born with cerebral palsy. Plaintiffs sought damages that included over $22 million in economic loss and future medical expenses. Evangelista v. Key Safety Systems, Inc., Superior Court of New Jersey, Case No. L-2845-09. Defense verdict following a two week trial on claims that a defective airbag sensor prevented a vehicle airbag from deploying and allowed plaintiff to sustain a severe neck injury that rendered her quadriplegic. Andrade v. General Motors, 336 Ill. App. 827, (2003). Upholding a defense verdict in a quadriplegic seatback case..
Leibel v. General Motors, 250 Mich. App. 229, (2002). Holding that an internal memorandum was subject to the attorney-client and work product privileges. Robert David v. Machinery Distribution Inc., 2003 WL 21920396 (2003). Affirming trial court's dismissal of plaintiff's defective design claim in a forklift case.